Black Friday, Travel League, Movies. Think I am going to take Saturday off this week. So don’t look for a blog. I assume many people will be shopping tomorrow. I totally don’t understand how we can have Black Friday sales in Ontario, but they are advertised all over so I guess people will be scrambling for bargains. Our Travel League went well – Matt and I both had our BLTs for lunch at the Crossroads and they were delicious as usual. I finished with a piece of war mincemeat tart and a dollop of cream. Yum. We then bought two tarts as I told you we would. We were supposed to get snow flurries, we did, kind of during lunch. Then went to the bowling alley and I bowled well for me, or for me lately anyway. Matt bowled reasonably well too but you can’t get him to admit it. Elmira is only a small alley with not many lanes, but a nice place to bowl. We had a fun day with lots of good friends. Last one this year, next Travel League is at the end of January. The mince tarts are now in the freezer. When we got home, I found a DVD awaiting me in the mail, Bloodsport, great movie and I don’t know why I never bought it before. It is one of my favourite martial arts films with Jean Claude Van Damme at his best. He was pretty young when he made this movie. I had forgotten it was based on a true story about Frank Dux who was reigning champion of the Kumite for several years. Bolo Yeung was the real baddie as Chong Li. He plays a good baddie I must say. He really makes one want to see him beaten up. Manipulating emotions which is what the blog I referred to yesterday was about. The movie was released in 1988. Another movie I like in similar vein was The Karate Kid. There was a remake, I’ve never seen it. I saw this recipe on Food and Wine and thought it looked delicious. I would call them Bruschetta myself, but they don’t. It was spoken of as a Thanksgiving appetiser. Fine but a bit late. However, I think it would make a great appetiser any time, and no, I don't know what Tuscan Kale is. Instead of creamed spinach, try this luxurious creamed kale on crunchy toasts. In a large saucepan of salted boiling water, blanch the kale until just tender, 3 to 5 minutes. Drain and let cool slightly, then finely chop. Preheat the broiler. In a large skillet, melt the butter. Add the garlic and cook over moderate heat, stirring, until just starting to brown, 2 minutes. Add the kale and crushed red pepper and cook for 2 minutes, tossing. Add the cream and bring just to a boil. Simmer over moderately low heat, stirring, until the cream has thickened, 5 minutes. Stir in 1/4 cup of the grated cheese and season with salt and pepper. Spoon the kale on the toasts and sprinkle with the remaining 1/4 cup of cheese. Broil for about 2 minutes, rotating the pan as necessary, until the cheese is just melted and the kale is hot. Serve right away. Make Ahead The creamed kale can be refrigerated overnight. Reheat gently before using. All my American friends will be stuffing themselves stupid with turkeys and hams today, I am envious, I love turkey, only thing I don’t like is Pumpkin Pie. I wish you all the very best Thanksgiving and hope everything you are thankful for continues to be a blessing in your lives. Then there is Hanukkah and once again, I wish those of you celebrating all the very best for the coming year. Today is the Travel League bowling I had mentioned the other day. We are going out of town to Elmira which is some distance away. As I said, we will be lunching at the Crossroads just outside town where they feature a huge buffet. The restaurant is Mennonite owned and staffed and they do a wonderful job. There is also a large gift store attached with the most fascinating items for gifts although I find it a little pricey. They also carry all kinds of beautiful table settings and decorative pieces for the home. I am always tempted but so far have never succumbed. As writers or aspiring writers, I think you should read this blog by a friend of mine in Australia, Hormones and Reading. Satima Flavell writes about workshops she attended and goes on to describe the subject of these workshops which I found extremely interesting. Finally she refers her readers to a book written by the leader of the workshop which would be useful reading to authors of all nationalities and types. Satima is a writer, editor and reviewer and is very involved in the writing scene in Australia. Do read her current blog, I am sure you will find it helpful. Here is something different to do with any turkey leftovers you may have. This came from BBC Good Food. Put the coriander stems and garlic in a food processor, pulse until finely chopped, add the turkey and 1 tsp of the fish sauce, and blend again. Roll into meatballs about 3cm in diameter. In a saucepan, heat the tom yum or curry paste with a splash of water for 2-3 mins. Pour in the coconut milk, stock, lime zest and juice, and remaining fish sauce. Bring to a simmer, add the meatballs and cook for 3 mins. Add the vegetables and cook for 5 mins more, or until the meatballs are cooked through. Add the noodles to warm through just before serving. Season, pour into 2 bowls and top with coriander leaves. Light Bulbs. Strokes. Guys and Dolls. When we first came to this apartment, the whole place had regular light bulbs. Fine, except the one in the kitchen kept burning out before you could turn round. Eventually we wised up and started using CFLs, there and in most of the rest of the place. Much later we kind of discovered we could probably have got the super to change the bulbs so we didn’t have to buy them, however, we always have bought our own and continue to do so. We had a big bulb to go into the kitchen and when it went out after many years of sterling service, we tried to replace it. However, these days, neither of us are that stead on our pins and we couldn’t threat this large bulb into the holder. Had to call the assistant super (super had a stroke a week or so ago). He fitted the bulb but damn me, it wouldn’t work, they cost about $15 too, couldn’t take it back, had it too long. The assistant said they are now using LED lights, about which we know nothing, so we went and bought a new CFL and fitted it. Now I need to find out about LEDs which I saw were sold in the store as well. I think the CFLs are great, they last forever, but I assume, because of what he said, that LEDs are better. Anyone know? I had forgotten to write about our superintendent having a stroke, I am pleased to say he is doing pretty well according to his wife. But a day or two after he went into the hospital, the assistant ended up in hospital as well. Poor woman was dealing with the building on her own. The super is carrying rather a lot of weight so I am not terribly surprised he had a stroke, it is apparently not his first. I am not sure if it was a stroke or a mini stroke (TIA) but he lost the use of his legs for a while although he is now able to walk again. I feel so sorry for his wife, she must have been going out of her mind when it happened and afterwards running this big building. Matt had lots of TIAs a few years ago so I know what it’s like. Last night I had a sentimental evening, I watched Guys and Dolls which was popular when I was 18 or so. I particularly love the song Your Eyes are the Eyes of A Woman in Love; a band to whom a bunch of us used to dance would play that for me and my current boyfriend every time they saw us. We used to belong to a club which held dances at the weekends. The movie starred Marlon Brando, Jean Simmons and Frank Sinatra with Vivian Blaine. The idea was taken from the books of Damon Runyan all of which I read at the time. I loved them. One never hears of them these days. There was a second movie (or maybe it was the first) made from his books all about Apple Annie. Frank Sinatra was in that one too. I have forgotten the name at the moment. Marlon Brando was particularly gorgeous in those days. Kevin Lynch of Closet Kitchen has come up with a good recipe. Saltimbocca is a traditional Italian recipe made with veal originally which is wrapped in prosciutto and flavoured with sage leaves, we have also made it with chicken. This recipe is made with shrimp and sounds pretty good. Shrimp wrapped in prosciutto with sage leaves served with a tasty browned buttery, lemony sage dipping sauce. Wrap the shrimp up in the prosciutto along with one small sage leaf optionally skewering them either on sticks or with toothpicks to hold the prosciutto on. Heat the oil in a pan over medium heat, add the shrimp and cook, about 2-3 minutes per side and set aside. Melt the butter in the pan, add the sage leaves and cook until the just start to change a darker color, and set aside on paper towels. Add the garlic and sauté until fragrant, about a minute. Add the wine to the pan, deglaze, simmer until it has reduced by half, about 3-5 minutes, add the lemon juice and butter and remove from heat stirring in the butter as it melts. Season the sauce with salt and pepper to taste, crumble the fried sage leaves and mix them in. Serve the shrimp along with the dipping sauce and enjoy! The Ninja Captain Alex J. Cavenaugh, recommended Almost Human so last night I watched it. I would have enjoyed it a lot more if it hadn’t been full of advertising. It was an hour long programme and if I got a full half hour of actual programme I will be very surprised. However, what I watched, I enjoyed. So thanks Alex, and maybe I will struggle through the ads and watch it again. I thought Karl Urban as Detective John Kennex was positively dishy. Don’t tell Matt. Afterwards we both watched another episode of “The Queen’s Castles” which was about Holyroodhouse Palace. A palace about which I knew very little. A lot of its history was centred around Mary Queen of Scots and her tragic existence. It centred very much in the continuous battle between the Scots and the English which was finally resolved after the defeat of Bonnie Prince Charlie. Although the Scots still clung to the Stuart cause for many a long year and I think deep down, there are Scots today who would welcome a Stuart on the throne. The name of the palace came from the Abbey, now in ruins, which is close by and Holyrood means Holy Cross. In passing I will mention my bowling was mostly disastrous although Matt’s was not. My cleaning lady problem is causing me a headache. Monday my original girl came in to clean bringing a friend with her who has been her support for a while. But, I still don’t know if she is ready to come back to work or not, so I still don’t know what to do about the couple who are coming to me on the 6th. If they do come it’s gonna be a pretty pricey couple of weeks for me as far as cleaning goes. I don’t want to tell them not to come at the last minute though. I really don’t know what to do. I would rather keep our original girl, she is very good, we are friends, and I don’t have to explain what I want done any more. She promised she would drop in later in the week. I’ve got bald patches from tearing out my hair. We used to do a recipe similar to this years ago, always delicious, when I saw this one on Cooking.com, I thought it was an ideal appetiser for the season. Make these simple appetizers and they'll be the first to run out at a gathering. Just 5 ingredients make these delicious treats! Wrap drained chestnuts in 1/3 piece of bacon and fasten with a toothpick. Place in two foil lined pie plates or cake pans. Mix brown sugar, chilli sauce and mayonnaise.Pour over chestnuts and bake at 350 degrees for one hour or until bacon is crisp. Dragon’s Friends, Travel League, Mince Meat Tart. Sunday Father Dragon (Al) celebrated his friends by having a party with all of us; the dwarves were all present to look after us, take our coats, and serve us wine – we were warned not to leave any glittery things or gummy bears in our coats but we were requested, by Dwarf Management, to tip the dwarves with said glittery things and gummy bears, or at the very least wine. I was lucky enough to be invited to this party and, as you will see, we were all awarded the Golden Scale as an encouragement for us to face any problems or adversity in our lives with courage and wisdom and to be our own hero. Father Dragon also wrote all our names on the dragon cave with his fiery breath and that will now be in my signature spot below. I see Yolanda Renee has already written a poetic tribute to our favourite dragon. The picture is Father Dragon greeting us with dragon hugs at the cave entrance. Thank you Al, and thanks for being my friend and entertaining me right royally although I did lose a few gummy bears. Well winter is certainly here, its been snowing a large portion of the weekend. We are lucky, it hasn’t settled with any depth in this area but in London, Ontario, they had a lot of the white stuff. We have a Travel League bowling meet scheduled for Thursday and as it’s out of town, we are hoping the snow won’t prevent us from going. Another reason for me, we usually lunch at The Crossroads when we go to Elmira and last year I discovered their mince meat tarts. I want to buy a couple. If, for any reason, we don’t get there on Thursday, I have informed Matt that we will have to make a special trip. 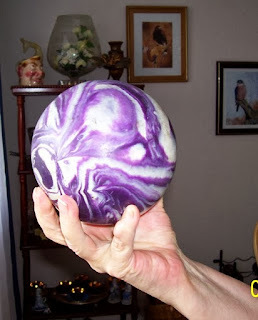 Talking of bowling, it tickled me how many comments my picture of a bowling ball provoked last week. Here’s an interesting starter which was sent by Cooking.com. This is a spicy appetizer that will liven up any get together. They are even good at room temperature. Mix soy sauce, honey, ginger and set aside as a dip. Combine garlic, cilantro. Place a small amount on a won ton wrap. Then place one shrimp on top at a diagonal (point of wrap at tail of shrimp and point of wrap at top of shrimp). Fold over using water to seal all but the tail of the shrimp and fry in apx. 1 inch of oil on each side until won ton is lightly browned. Drain and serve with sauce for dipping. Garnish dish with cilantro. Cleaners, Father Dragon, Treadmill Silicone. Thought we had it all sorted out, now, however, our previous cleaner turned up with our keys and because it is going to be another couple of weeks or so before the new people come in she has offered to come in on Monday with her friend. We said yes. Now Matt says he thinks she wants to come back. We really don’t know and don’t know what to do. She is excellent at the job but still very upset. If she does want to come back, we would like to have her, but…. Don’t forget tomorrow, November 24, is Father Dragon`s mystery day. Tune in to his blog to find out what it`s all about. This morning, I figured it was time my treadmill should be lubricated again. A horrid job but it has to be done at least every 6 months, more if you use it a lot. Apart from our inability to get down on the floor to do the work, we have a big problem with the silicone bottle. You unscrew the cap and then are supposed to be able to cut it open with a pair of scissors. Joke. We tried scissors, knives and eventually Matt used the cable cutting section on a pair of pliers. I complained to Johnson Health who assured me it could be cut with scissors. I wonder what kind of scissors they use. If I had known about this, I probably would not have bought myself a treadmill. Even once you do get a hole in the stupid bottle, its a messy job. Oh, if anyone does know how to open these things, please share. This recipe was so nice and colourful; plus I am looking for something different to do for an upcoming dinner party so thought I would share it. Oops, just realised, I maybe can't eat it because of the similarity to grapefruit. If one is on a statin, grapefruit is a no no. Using a vegetable peeler, remove zest from tangelos in long strips. Cut the strips lengthwise into very thin pieces. Cut the tangelos in half and squeeze enough juice from them to get 1/2 cup. For those of you who can't conceive the 5 pin ball, here is a picture of me holding mine. We have two each. They weigh about 3 lbs. No holes. Bowling, Cleaners. Tailor and Chestnuts. Not a good day for bowling for me, a pretty good day for Matt and our one friend who came today. The other friend couldn’t make it, having furnace trouble. I have been telling him they should move into an apartment, so I got another dig in about this assuring him we were nice and warm and hadn’t spent a couple of days without heat. He wants to move into an apartment, but I think his wife is not so keen on the idea. Whilst we were bowling one of the owners showed us a thumb hole ball. I had neither seen nor heard of such a thing. The one he showed us was for a customer, but he had two in their downstairs alley and brought them up for us to try. All three of us did, but after playing with them for several frames, we all decided we much preferred our own balls. What we couldn’t understand was why the customer had ordered two balls, one with a thumb hole and one without. We all thought the thumb hole edging threw the ball off. Took three pairs of pants to the tailor after bowling. Two to be taken in and one, the pantsuit pants, to be shortened. Gonna cost me about $50 in total, but cheaper than buying new pants, particularly as I am planning to lose more weight. Although I am not doing too well this week. Thursday afternoon I bought a few chestnuts as I was hungry for them. Cooked a few in the microwave (having found a method on line) and ate them. One of the things I loved in Portugal was that you could buy roasted chestnuts in the streets. They used to do that in England but I hadn’t seen it in years. Thursday morning we were visited by two women who are offering to clean for us. They were a little more expensive, but from everything they said, I think they will do a really good job. I told them I would call them and when they had gone, Matt and I discussed it. We decided a definite yes so eventually we called them back and hired them. They actually asked for more money, but when I said it was too rich for our blood, they dropped to something we felt capable of sustaining. So that is a problem off our shoulders. I thought I had posted this recipe before, but on checking it appeared I hadn’t. I have made this a couple of times because it’s so easy. The second time I made it in the slow cooker although because I wasn’t expecting to do that I ended up with too much liquid, if you want to use a slow cooker, don’t use the water and certainly cut down the tomato juice from the canned tomatoes. Actually, I didn’t use the water when I made it in a skillet. The ingredients also call for tomato sauce, I don’t keep that in cans and usually make my own but didn’t have any, so I subbed with tomato ketchup. Tastes fine. In a large skillet, heat olive oil over medium heat. Add the ground beef and onion and cook, stirring, until ground beef is no longer pink and onion is tender. Add the garlic and continue cooking for 1 minute. Add the chopped cabbage, tomatoes, tomato sauce, pepper, and salt. Bring to a boil. Cover and simmer for 20 to 30 minutes, or until cabbage is tender. Feast or Famine. My cleaning girl left us a couple of weeks ago, she h as more upsets and stresses going on in her life than a barrel load of monkeys. So, in fact, this apartment hasn’t really been cleaned since September. Matt and I have both putzed at it, but we both hurt so much after a very short stint that we cannot achieve a lot. I went to Community Services and they have promised someone but they are not sure when. Wednesday morning, still nothing when I phoned. I knew there were business cards downstairs so I got one and phoned a couple who clean together and they are probably coming this morning for a meet and greet. Then, damn me, a girl phoned from Community Services and she is coming in to clean on Friday morning. I think I will still check the other couple out just in case. I got my Christmas present from Matt yesterday. It arrived in the mail. Not bad considering I also received an email saying they had sent it that morning. It is a pant suit. Only trouble is, the pants want shortening and when it comes to sewing I am out. Will have to go pay through the nose to get it done. As I also have a couple of pairs of pants I want taken in, guess I will do it all at the same time. I am delighted with the pant suit though, mine is black. It’s nice and Christmassy but not too much so to be worn the rest of the year if the occasion arises. I ordered it and then informed Matt what he had bought me. Checking for the picture, guess I got mine at a good price, it’s quite a bit more now. Went to the Mandarin as I mentioned yesterday, had a good meal as usual. Pigged out on the desserts, bad girl, will have to do some work to get rid of that. Especially having just tipped the 29 lbs. mark. I would like to get to 30 by Christmas. Bowling this aft which helps. Made Unstuffed Cabbage Rolls again. Thought I had posted the recipe, apparently I haven't. This time I put them in the crock pot. Having eaten lots of Chinese for lunch though, we saved it for tonight. Not sure if it will freeze well, but it will have to. There is stacks there and twice in a row is about all I want to eat something. I love curries, I love Thai curries. So here’s one from BBC Food. Oh, and I also love Thai food. I came across a shrimp recipe which required 2 tbs coconut milk, I could save that amount from this recipe. Heat a little of the oil in a large pan and brown the beef in batches, removing to a plate after, reserving any juices. If your slow cooker has a browning function, use this instead. Meanwhile, in a mini chopper or food processor, whizz half the coriander, the chopped lemongrass, garlic, chillies and galangal with the rest of the oil until you have a rough paste. Turn the slow cooker to High. Heat the paste for a few mins, then add the beef and all the remaining ingredients, apart from the remaining coriander and lime juice. Turn slow cooker to Low and cook for 8 hrs, or until the meat is falling off the bone. If using beef ribs, remove bones from the beef, then shred the meat with 2 forks. If the sauce is too thin, strain it off and boil it to reduce. Stir in the remaining coriander and lime juice, then season with more fish sauce or sugar. Chia Seeds, Chocolate Kisses, Mandarin. Almost ever since I was told I had diabetes, I have been eating flax every day. These days one hears so much about chia seeds and how they are even better for you than flax, so, although they are pretty expensive, we bought some yesterday to try. Chia seeds are the things you put on Chia pets to grow green critters. We have a good friend who takes them all the time and swears by them, sound like a cure all for everything. So we will see what happens. I am getting very frustrated. Hershey assures me I can buy dark chocolate Kisses in Canada. We have been hunting around for a while and cannot find them anywhere. Matt doesn’t enjoy milk chocolate and when we are in the States he can get the dark chocolate Kisses. Amazon.com have them but can’t ship them to me, international shipping laws I suppose. We brought some bags home in September, but they, of course, have long gone. Hmm, just saw an ad for them at Walmart. I wonder if Walmart in Canada stock them, haven’t tried there. Damn, we were in Walmart yesterday buying a new frying pan. I have talked about the Mandarin Chinese restaurant where we love to eat. Going for lunch today with a couple of friends as we want to get in a visit before they increase their prices because they start offering Christmas goodies like turkey. Who on earth goes to the Mandarin to eat turkey, I surely don’t. I’m only sorry the moon festival is well and truly over, I do like the moon cakes even if no-one else does. I suppose one wouldn’t look forward to them if these seasonal specials were available all the time. This looks like a delicious pecan pie, I have been coming across lots of them lately, anyone would think the US Thanksgiving was coming up. I think I would use butter by the way. "this is a very smooth center pecan pie..melts in your mouth ..also from fireman's firehouse cookbook...a real beauty of a pie .."
In a saucepan, melt margarine with brown sugar. Add eggs, salt, and vanilla and mix well. Bake in preheated oven at 350 degrees for 45 minutes. What a dingbat, forgot to post this once again. Must be what comes with being an old dragon grandma. Bowling good again if not quite as good as last Monday. Matt bowled pretty well too except for his first game. It is incredibly windy at the moment. Last night I was having trouble sleeping with the whistling wind howling round the building and it has been blowing all day long. Think we saw a few snow flakes, but not quite sure. Had our first Christmas card today. Friend is on a cruise so I guess she figured she would get them out before she went. Talking of cards, I posted one to a friend who lives locally. Her birthday was Wednesday a week ago and she still hasn’t got the card. Checked the address with her today, it was correct so I have no idea why she didn’t receive it. I went to the post office to replace my stamps for the US and checked on postage to Mexico. I was very surprised it was the same rate as for overseas, i.e. Australia, Africa, England and so on. I thought it would be the same as for the US. Many people don’t like Brussels Sprouts, I always loved them, but have been looking for a change for a while and this one from Closet Cooking by Kevin Lynch sounds as though it would be perfect. Brussels sprouts baked in a creamy mustard sauce along with smoky bacon all topped in a crispy golden brown parmesan crust. Blanch the Brussels sprouts until just tender and set aside. Cook the bacon in a pan, set it aside and drain all but a tablespoon of the grease. Add the butter to the pan and let it melt and then bubble. Add the onion and cook until tender, about 5-7 minutes. Mix in the flour and let simmer until it just starts to brown a little. Mix in the milk, nutmeg, mustard, salt and pepper and half of the cheese and heat until the cheese melts and the sauce thickens. Mix Brussels sprouts and bacon into the sauce and pour into a baking dish. Mix the bread crumbs and the remaining cheese and sprinkle on top of the Brussels sprouts. Bake in a preheated 350F oven until it is bubbling on the sides and golden brown on top, about 15-20 minutes. I was thinking about books the other day. When I was younger, people disapproved of paperbacks. You could give them a copy of War and Peace but if it wasn’t in a hard cover, they considered it trashy. Paperbacks weren’t quite the thing. That attitude has gone by the board, but today people will tell you they don’t like ebooks because they like the feel of a paper book in their hands, even the smell of one? Here again, I personally don’t care how a book comes, if the story is good I am happy. Which is why I love my Kindle. I no longer have to store books on shelves which get dusty. I still have a lot of paper books, but I don’t anticipate every buying any more. If I can’t get it in Kindle format then I will go to the library. If they haven’t got it, I guess I am destined never to read it. Looking for pictures I came across this “book igloo” which was created by Colombian artist Miler Lagos. Clever. Back to topic, people can burn paper books too, more difficult to destroy ebooks on people’s readers. On Friday I purchased a bunch of Christmas stamps for my cards. The only one I didn’t get was the one with the woman. They are sold in books of about 6, certainly the $1.10 ones are in sixes anyway. So I started putting them on the appropriate envelopes. I lifted two of the one of a deer and realised the stamp, once removed, only said ANADA, the C and some of the picture remaining behind. I immediately figured I had something. I went looking for advice. I ended up discovering that a local philately shop would pay me three times what I paid right now, but that if I hung on to them and it turned out they were the only ones, I might get more. So hanging on I am. Only trouble was I am now 6 stamps short and couldn’t get finished. We had a good evening at the Pig Tail dinner on Saturday and as usual the pigtails themselves were delicious. The evening is usually successful and this year they were delighted to have had something like 350 people there. They announced how much they had made as well, it was quite a substantial amount. They apparently cooked 950 pigtails. That’s a lot of pigs. When this topic came up I think everyone felt a little guilty. Silly really, we are all meat eaters obviously, but…. I have decided I need to buy some to roast which is the way I like them best. I could have bought some there – friend bought a dozen – already cooked – for $10. I didn’t bother as Matt never eats them anyway, he has the schnitzels instead. I had forgotten how much I like sauerkraut too, long time since I ate any. Bacon is frequently added in this area. It was also a satisfactory evening for me as I was wearing clothes I hadn’t worn in a very long time and I even risked high heels, not very high, but certainly not flat. I felt good. The scales aren’t showing much movement, but my figure is firming up and has decreased quite a bit according to my wardrobe. One thing I am please about, my winter coat, which I haven't been able to wear for years, is now wearable again. I don't have a lot of call for a full coat, but I am so glad this one is available to me again as I hadn't worn it a whole heck of a lot. Spiced nuts are always popular at this time of year, so here is a recipe from Web MD. Make plenty of these mildly sweet and salty nuts—they are great to have on hand over the holidays. Spread pecans on a large baking sheet. Roast until fragrant, about 12 minutes. Watch carefully so they don’t burn. Combine brown sugar, salt, thyme, rosemary, pepper and piment d’Espelette (or cayenne) in a small bowl. 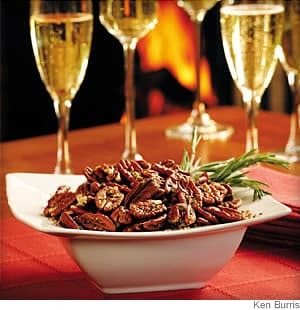 Transfer the roasted pecans to a large bowl, drizzle with oil and toss well to coat completely. Sprinkle with the spice mixture and toss again. Serve warm or let cool completely and store in an airtight container. Friday, Grandma Dragon, Pig Tails. EDG Scope. Pictures of Our Sunday Lunch. Spices and Salmonella, Hallowe’en, Bowling.